Bell & Ross, in conjunction with leading Swiss watch retailer, 8th Avenue Watch Co, has signed a new lease to open its first stand-alone boutique in Australia. Colliers International’s Mike Crittenden introduced and negotiated the new lease, in conjunction with The Block Arcade managing agent Patrick Barnes of Allard Shelton. “One of Melbourne’s most iconic landmarks, The Block Arcade is a prestigious retail shopping centre in the heart of the Collins Street retail precinct,” Mr Crittenden said. The Melbourne arcade is famous for its period architecture featuring a Victorian facade, mosaic floor and glazed dome. It will be the 13th Bell & Ross boutique worldwide, as part of a global brand expansion program to complement its existing retail footprint in Paris, Vienna, Prague, Moscow, Dubai, Kuala Lumpur, Jakarta, Taiwan, Singapore, Beijing and Macau. 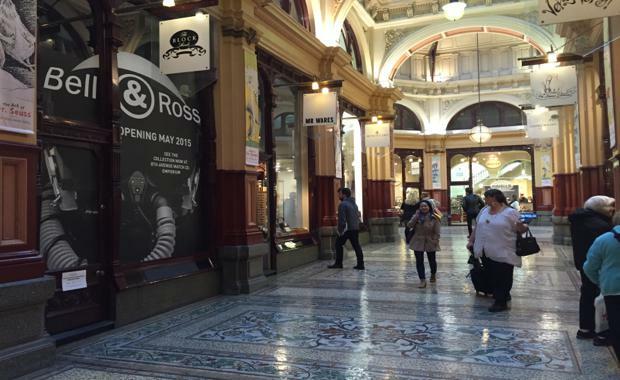 “The Bell & Ross store at The Block Arcade will be Melbourne’s first flagship operation, offering ranges not available at the 8th Avenue Watch Co Emporium store,” Graeme Goldman, founder of 8th Avenue Watch Co, said.